Some ideas people commonly overlook are space for a mudroom, a homework space, a computer space, second sink, a display space for fine dinnerware, mood lighting, and natural light. There are many other possibilities to consider. While you won't be able to afford them all, you might be surprised by how much is possible. The second aspect of kitchen design is layout. Some call it the battle of the inches. Most courses and guides on kitchen design focus on this element. This is where you look at the various features of the kitchen and decide what should go where and how many inches every component should lie from every other related component. For years the key to the design was what they called the "work triangle": the arrangement of the refrigerator, sink and stove. With the increasing use of microwaves, many now refer to the "work diamond." Most kitchen activities involve these three or four fixtures. One thing you'll inevitably discover is that you'll want to add space to your kitchen. Actually kitchens have been growing about 50% per decade since the fifties. The final element in good design is aesthetic. Choosing the right colors, finishes, textures, etc. is important to creating a pleasing space. Kitchen remodeling ranks among the most popular remodeling projects each year, as kitchens have become the functional and social hubs for many families. Almost every kitchen has a design flaw or something that can be changed to make the space more workable. However, no challenge is quite as difficult as reworking a small kitchen space. If you are on a tight budget, have building restrictions, or own a condominium where you must work with the space allotted, there are options that can help transform your kitchen. Use the following tips as a guide. 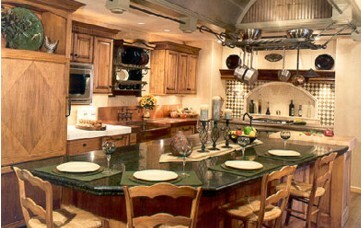 Even large kitchens are difficult to work in if there isn’t enough counter space. Plan to cover as much of the area not occupied with appliances with counters. If the difference in floor space is a matter of a few square feet, plan your design with deeper counters. hold plates should be located near the dishwasher, and large cabinets with slide-out drawers should be placed near the oven. The fewer unnecessary steps needed to complete a task, the smoother the function of your kitchen will be. and toasters can quickly get small appliances out of sight, but keep them easily at hand. Built-in storage for foods like potatoes and onions, and bread storage cabinets will also give the kitchen a cleaner look. If there isn’t enough room for a closet pantry, many cabinet manufacturers now make roll-out pantries. These can be pulled out to view the items you have, but rolled back into a space about 18 inches wide and 5 1/2 feet tall. If there isn’t room for any type of pantry, consider converting a closet outside of the kitchen to a storage area for fine china, large pots and infrequently used items. An easily overlooked design element is good lighting. Under counter lighting and clean halogen lights can make the space appear larger and more comfortable. A small kitchen does not have to have a small sink! A large sink will make it easier for you to clean large pots and pans, and is a great place to stash the dirty pots before you have a chance to rinse them. If you are in an apartment or a small house, a large sink in the kitchen can serve double duty as a utility sink, too. · Put a wire basket on the inside of the cabinet to hold trash bags and other frequently used items. These store-bought products are affordable and easy to install on the back of the cabinet door or under the sink. · Mount an instant hot water heater on the sink. This is something small that makes a big difference. Installing such a device will usually replace the sprayer or soap. This could be really useful if you indulge in a cup of tea or instant coffee each day. · Install a tile back splash on all the walls above the counters, stove and sink. Doing this can quickly change the look of the kitchen and make it easier to clean. special touch. There are a lot of unique designs out there, so be prepared to use your creative side.